We've been living in our East London home for just about a year now, and it's taken me a year to get around to sorting out the garden. When we first moved in, one of the things I was the most excited about what finally having an outdoor space - bistro night could actually be spent in a real outdoor space, instead of pushing our table against the open window of our old flat. We moved in in August 2017 and August quickly turned into September, and then it seems that winter came around really quickly so we didn't get to enjoy much time outdoors. That, and in January our back fence blew down with the wind and it took over 3 months to get fixed so we banished this space for quite some time... defeated by the idea of clearing it up. 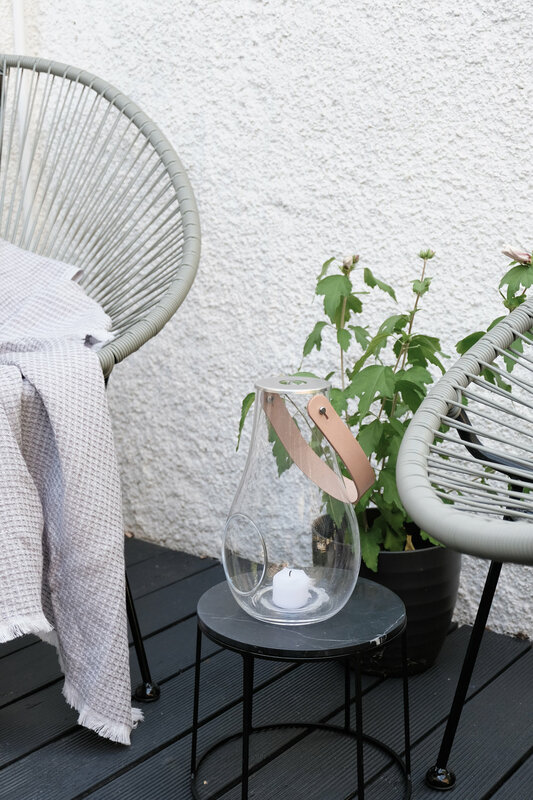 As this summer seems to be going on forever, I wanted to create a cosy space out on the deck to enjoy an early morning coffee or late afternoon glass of rosé (the sun hits the deck from midday to 3 PM so it's quite tough being out here during these times). We already owned some simple wooden Ikea dining chairs, but wanted something where we could lounge on, put our feet up and just enjoy the outdoor breeze. I have always been a fan of the hammock like design of the 1950's Acapulco chairs, drawn to their deep seat and pear shape. There's lots of chairs out on the market inspired by this Mexican classic, however they are mainly bright colours which is a big no-no for me. I found a beautiful soft grey model from Cox & Cox and instantly fell in love. It's been crazy how much difference having these chairs have made to contribute to a relaxed, fuss free outdoor experience. We seem to gravitate towards these chairs as soon as we come home from work now, armed with a G&T or wine and just chat away about our days for hours. For cooler evenings or added cosiness, I add a throw / towel like you can see here. This one Lapuan Kankurit from Cloudberry Living is a towel and has so many uses - bath towel, beach towel, picnic towel and chair throw! As the walls are white and the the deck is charcoal, it was important to add a little pop of nature, so I opted for a simple green plant in a black pot. I chose an hibiscus because there's nothing more satisfying than seeing the little flowers bloom daily, adding a little touch of colour to a monochrome space. 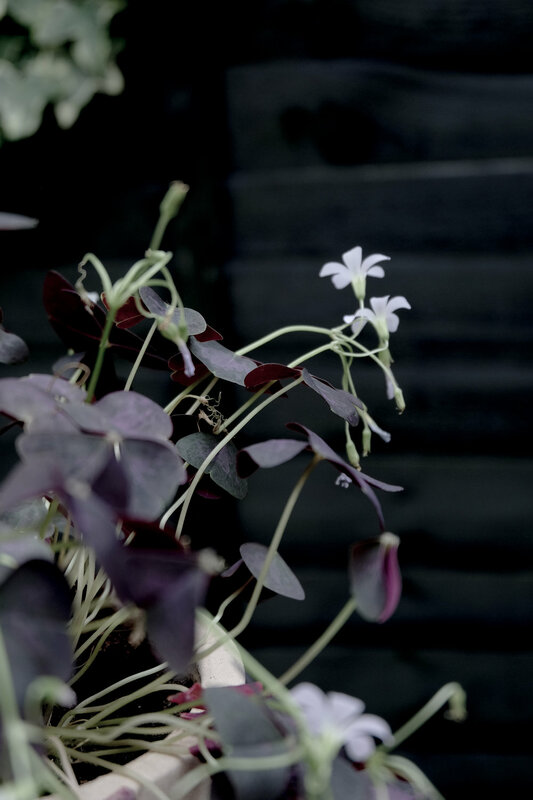 I also got a cute little Oxalis Triangularis purpurea (had to google the name..) to add to my Skagerak pot - it's a perenial so will last quite a long time, and again I didn't want to go too colourful so the deep purple seemed perfect. As we already have a small garden dining table on the deck, I was after something shorter, smaller yet functional that would host our glasses whilst we sit on the chairs. 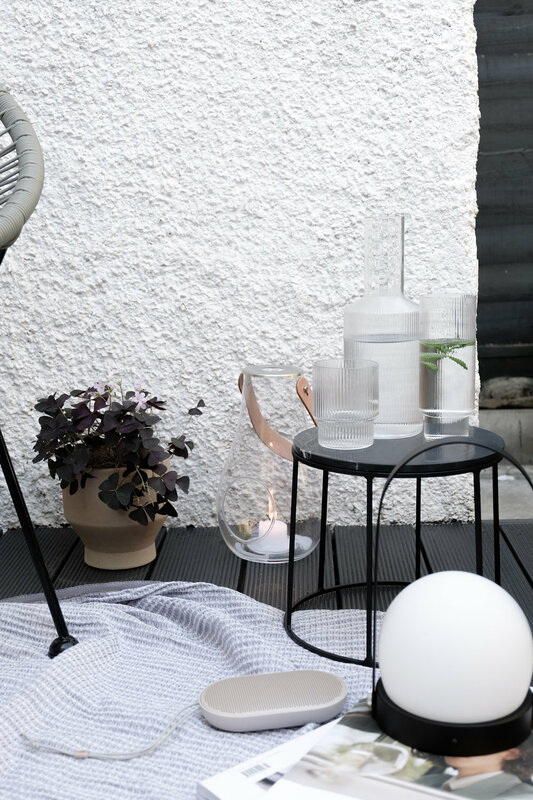 I didn't want anything too large as the deck is not the biggest, so I went for the MENU Wire marble series indoor/outdoor small table designed by Norm Architects. It's cute, small and elegant and perfect between the two string chairs. Definitely at the top of the priority list for every room whether it is indoor or outdoor. We've had festoon lights strung up for over a year which I love as it means we get to spend late evenings outdoors, but for this little makeover I wanted to add a couple more light sources to add to the cosiness of the space. 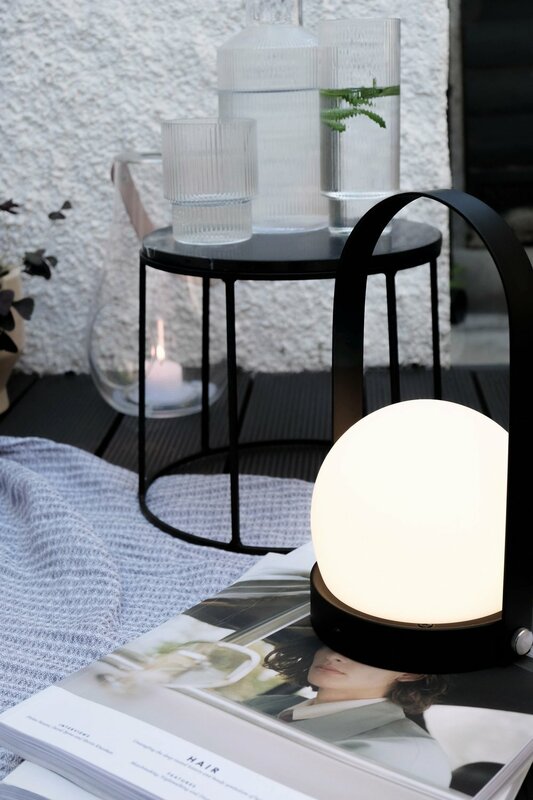 Even when it's not pitch black, I love lighting candles and so I decided to get the Holmegaard lantern that I had been eyeing up for a while. Placed on the floor or on the MENU wire table, it looks beautifully decorative too, and the leather handle makes it easily transportable around the garden. For additional lighting, I add the MENU Carrie lamp which can also be moved around easily. As well as a space to lounge, I wanted a little space where we could continue out bistro evenings or lunch. For the time being, I have left the old Ikea garden set we already owned, but I would love the Hay Palissade table and chairs as a replacement - this will have to wait though... To make the dining corner less overlooked by neighbours and feel more intimate, I added a simple cream parasol. It's crazy how much difference it makes to this corner. Not only does it add some very welcomed shade, but it somehow now feels like we are on a constant holiday in the South of France sitting underneath it. Et voilà! you only need a few items to create a cosy space, and whilst this is still a work in progress, it's definitely a space I will be using a lot more. Cox & Cox kindly gifted the wire chairs for the purpose of this post. All pictures and words my own. 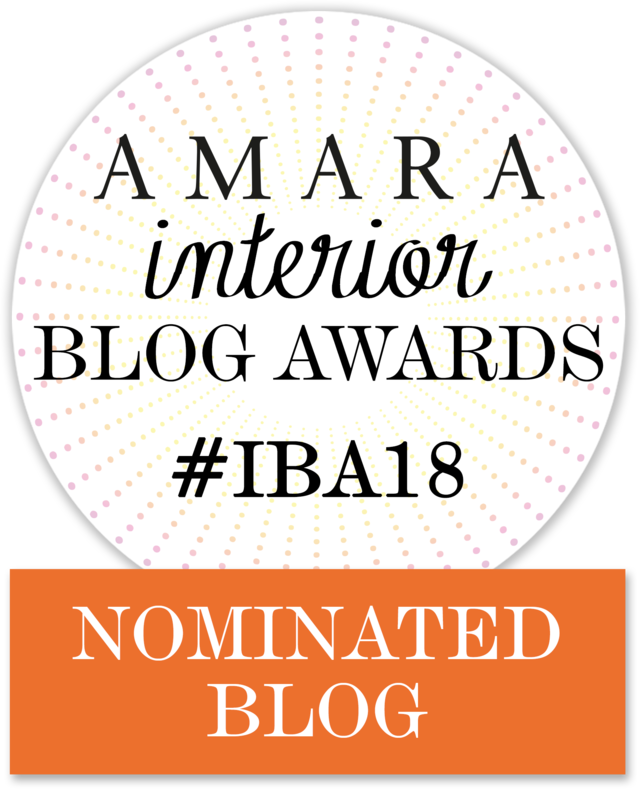 In july 2018 I will be launching my fortnightly newsletters featuring my favourite latest items, design tips and more. If you are interested in registering your interest please sign up below!